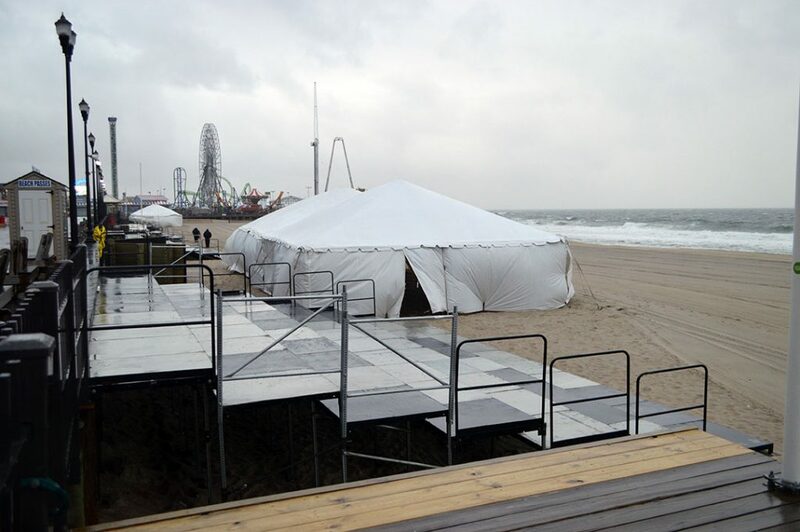 The annual Seaside Heights Polar Plunge is set for Saturday, and borough crews have been working hard – including during Thursday’s rain, wind and spray from pounding surf – to get the town ready. The plunge benefits Special Olympics New Jersey. The first order on tap was figuring out a way to get thousands of plungers from the boardwalk to the sand. The borough removed all of the beach entrances from the boardwalk prior to the winter since a beach replenishment project had been planned to be underway during the off-season. But the project was delayed, leaving no easy beach access. That was solved this week by the placement of a large bleacher-like system near Sumner Avenue, where the plunge is taking place. 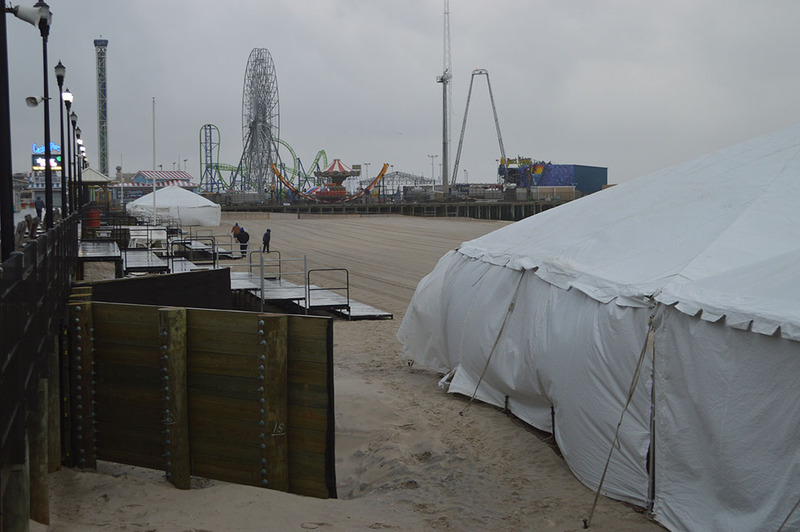 Beyond the jumbo-sized beach entrance, crews have been erecting tents and other pieces of infrastructure that will serve as points of registration and management for the event. There will also be a number of street closures. 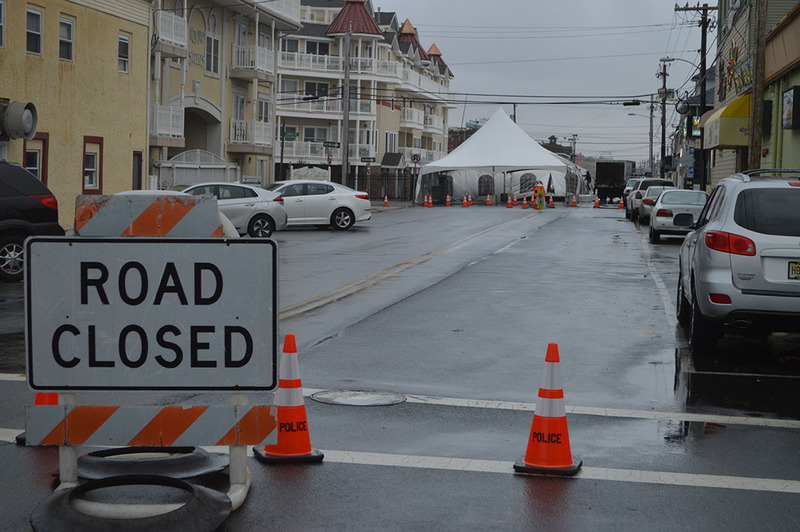 According to borough officials, Ocean Terrace between Sherman and Sumner Avenues, and Grant Avenue between Ocean Terrace and the Boulevard, will be closed to traffic Friday and Saturday. There are also delays expected on the Route 37 bridge, as only one lane of traffic is open eastbound from the mainland. As in the past, state officials are advising drivers to consider accessing the event using Route 35, from the north. The state Department of Transportation also said no vehicles, trailers or parade floats exceeding 11 feet will be permitted on the bridge heading eastbound into Seaside Heights.